Ask fellow campers about "Winchester RV Park and Campground" and nearby attractions. 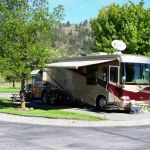 The paved sites and drives, the lush grass and the shade from many trees was an awesome break from the normal dry and dusty conditions we encounter in most RV parks in August. The owners are friendly and helpful, even loaning us a cooler to use while defrosting our fridge. We camped at Winchester RV Park and Campground in a Fifth Wheel. The town of Republic is small, but includes a health food coop and brew pub. There is an old railroad line that has been converted to a walking, running and biking path that goes from downtown right by the park and all the way to the far end of Curlew Lake, making this rv park a great place to hang out if you walk, bike and/or run. Curlew Lake is nearby for fishing and water sports enthusiasts. This is a great RV Park! We are on our way back to Florida after going up the Alaska Highway to Alaska and back down the Cassiar and this is the nicest RV park we've been in! It's quiet. It's clean and neat. The bathroom and shower facilities are immaculate. All the sites are paved as are the roads. I cannot recommend this place highly enough. In fact, we like it so much we are going to spend another night. We want to explore the neat little town in the middle of awesome scenery called Republic, WA. We camped at Winchester RV Park and Campground in a Travel Trailer. Nice park in remote area. Quiet. Wifi is a bit iffy. No Verizon. Near Curlew State Park but not a lot of activities. Good place to relax and do nothing. We camped at Winchester RV Park and Campground in a Motorhome. Beautiful location, sites are large with nice trees for shade. The owners, are so warm and welcoming. Making sure we had a good experience in the area. Even took us morel mushroom hunting!!! What a wonderful bonus! Will definitely return and definitely recommend. We camped at Winchester RV Park and Campground in a Travel Trailer. We went for hiking in the local area. Sherman pass is gorgeous!! Due to the location, we weren't expecting very much so this RV Park was a pleasant surprise. It has lovely shade trees, lush green grass between sites, immaculate bathrooms and laundry room, moderate prices, level paved sites, and friendly helpful staff. There is a gazebo with gas grills - much cleaner than our own- which included grill utensils & hot mitts. They even provided blocks to put under jacks. The WiFi connection was fast and dependable, which is one area where most RV parks fall short. There is a multi-use trail behind the park that goes back to the town of Republic in one direction, and as far as Canada in the other. If you find yourself near this area, make sure to stay here! We would definitely return. We camped at Winchester RV Park and Campground in a Truck Camper. This well groomed, immaculate park is located about 4 miles outside of the town of Republic. Very close to Curlew lake. Would have give this one a 10 but getting into some of the sites are a bit tight for a bigger rig to back into. The sites are generously spaced, offering ample room. Hosts are friendly, helpful, and hard workers as their park clearly shows the amount of care and attention they pay. Will be coming back for years to come. We camped at Winchester RV Park and Campground in a Motorhome. Republic Brewery - award winning micro brew. Try their homemade ginger ale (non alcoholic), root beer and creme soda's too! Scott Brothers Coffee roasters just north of Curlew (approx 30 minutes) Award winning coffees. Price reflects Good Sam discount. We stayed here two nights. Friendly, competent desk staff. Free Wi-Fi. All sites are paved with picnic table at rear of site, allowing for maximum use of space. Thick green grass and mature trees between sites, very well manicured and clean. Four complimentary wood pads for jacks at each site to protect blacktop. Quiet park, very nice stay here as we traveled through on our destination. We camped at Winchester RV Park and Campground in a Motorhome. It just keeps getting better! We’re about to complete our 8th summer in this beautiful place. The owners continue maintain and improve the park. New sprinkler systems, regular fertilizing, and mowing have the lawns looking like golf greens. The previous good reviews say it all. Fall is arriving and it’s time to migrate south, we look forward to returning next spring. We camped at Winchester RV Park and Campground in a Motorhome. Meticulously maintained park in a pleasant setting. Although most of the guests seem to be permanent residents, all the RVs were tidy and clean. Did not use the shower or restroom but have no doubt that they are as immaculate as the rest of the park. The laundry was spotlessly clean. Owners very helpful and friendly and the WiFi is good. No CATV and the sites are quite close together but it's a good overnight stop. We camped at Winchester RV Park and Campground in a Motorhome. Great spot. Very helpful owners. Paved sites. Open grassy. Good utilities. Lots of grass. Extremely we'll maintained. Peaceful. Would look forward to coming back. We camped at Winchester RV Park and Campground in a Motorhome. Probably the best park we have stayed at in our extensive travels. Just out of town, quiet, immaculately groomed park with very helpful owners. Also has great storage if required. We keep coming back to Winchester RV park! We camped at Winchester RV Park and Campground in a Fifth Wheel. We made reservation for two nights for at the $15.50 per night Passport America rate. The park has nice blacktop pads and grass, but I was told they had Wi-Fi, but it is not strong enough to connect in the back of the park. Also, they have many nice sites with grass, but we were put in the back of the park on a side by side site that was put in backwards (I mean our awning and door side faces the next camper and is only about 6 feet between me and the next camper and it is all blacktop and no grass--very narrow). Our extended slide is on the white line on the blacktop that marks the border for the next campsite, which is also on blacktop. We cannot put out our awnings nor do we have any place to sit outside. If you stay here, request a no side-by-side site in the front of the park. You also need to be close to the front for Wi-Fi. We camped at Winchester RV Park and Campground in a Motorhome. Efficient and welcoming on arrival. This RV park is immaculate and we were very comfortable. When we needed help, we received it instantly. The facilities include the use of a gas grill in the gazebo which was a nice touch. The showers require coins. The park was very quiet, thankfully. We camped at Winchester RV Park and Campground in a Motorhome. Winchester RV Park is a very friendly and well kept park. The staff is very professional, the sites well maintained, and the grounds immaculate. We didn't use the showers/restroom facilities since we have full hookups, but we did use the laundry. The laundry room was very clean and they had big machines at a reasonable rate. Access to the local "Rails to Trails" project is within walking distance. We were so relaxed there we stayed an extra night. We camped at Winchester RV Park and Campground in a Travel Trailer. Republic Brewery - award winning micro brew. Try their homemade ginger ale (non alcoholic), root beer and creme soda's too! Scott Brothers Coffee roasters just north of Curlew (approx 30 minutes) Award winning coffees. Fishing in Lake Curlew. Are you affiliated with Winchester RV Park and Campground ?